We aim to bring you the safest and most satisfying shooting sports experience. Keeping you and your firearms secure is a part of that commitment. 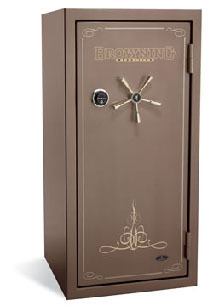 That’s why at Midwest Gun and Range we sell the best option in firearms security—Browning Gun Safes. Midwest Gun and Range stocks Browning Gun Safes in a variety of sizes and styles that fit beautifully into your home as they protect your gun collection from theft and fire and your family from accidental harm. As you preview our selection, please note that each model of gun safe comes with different options. Contact us for details you may not see in the gun safe previews below. Better yet, stop into Midwest Gun and Range and we’ll help you choose the exact protection that you need in a gun safe. Our two models of the Browning Theftgard are available with your choice of dial lock or electronic locking system. The Duo-Plus™ storage system allows you to change the interior storage configuration as well as providing room for long gun storage on the gun safe door. 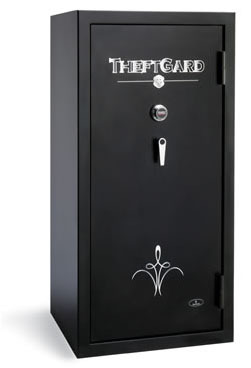 Affordably priced, yet offering excellent security, the Theft Guard also provides up to 30 minutes of fire protection at temperatures up to 1200°F. Color: Black or Forest Green *Price: W/Dial Lock or W/Elec Lock - Contact Midwest Gun & Range for full details on gun safes! TG15F: 60”H X 24”W X 18”D –holds 9/18 Guns Color: Black *Price: W/Dial Lock or W/Elec Lock - Contact Midwest Gun & Range for full details on gun safes! Step up to the Browning Bronze. DPX® storage puts your long guns, handguns, and other valuables at your fingertips and Browning’s Force Deflector™ locking mechanism keeps them securely tucked away from intruders. The Bronze also provides fire protection up to 45 minutes at 1200°F. Color: Gloss Black Price: W/Elec Lock - Contact Midwest Gun & Range for full details on gun safes! 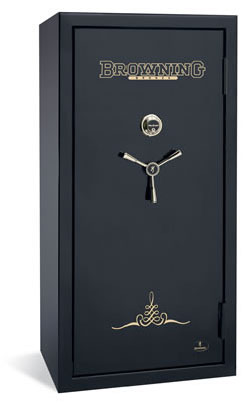 *Price: W/Dial Lock - Contact Midwest Gun & Range for full details on gun safes! When you want premium protection and large capacity storage for your firearms and valuables, choose the Browning Medallion. Equipped with Browning’s Uni-Force™ two cam locking system and Omnibarrier® lock protection system, as well as excellent security, the Medallion provides up to 30 minutes of fire protection at temperatures up to 1550°F. *Price: Contact Midwest Gun & Range for full details on gun safes! Need help with delivery of your gun safe? *Prices are subject to change. All prices are “cash and carry”, but we do accept your major credit card. Contact Midwest Gun and Range for full details on gun safes!